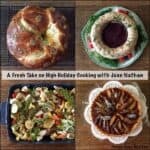 I hosted a cooking class with legendary cookbook author Joan Nathan.We gathered around my kitchen island. It felt like an intimate group of girlfriends hanging out, getting cooking tips and enjoying Joan’s stories. 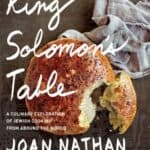 Joan Nathan is a compelling storyteller, and the backstory to each recipe is fascinating. 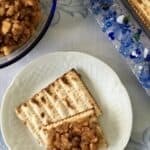 Joan has spent decades researching Jewish food history and collecting recipes from Jewish cooks around the world. Sometimes I just want to change up dinner and try something new. I don’t know if I’m late to the party, but these potatoes are the bomb. They might be so 2014 because I think I saw these all over the Web last year. Recently, I was at the farmers market thinking that I just keep walking by Weiser Family Farms’ lovely little potatoes week after week. I hadn’t bought them in a while because I didn’t feel inspired. Then it just hit me: I must buy these potatoes and smash them. And so I did. Revelatory. 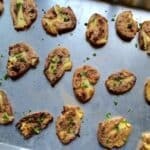 This recipe has to be one of the only family recipes that I haven’t tinkered with. The recipe is simple and perfectly balanced as is. This is a rare family recipe that actually comes with precise measurements. So many of my family’s legendary old recipes seem to be just a list of ingredients without measurements or directions. My seven-year-old daughter keeps asking me to tell her stories about my childhood. The story that intrigues her the most is the one about holiday baking with my grandma. Every December my sister and I would spend a day with our grandma and bake cookies all day. 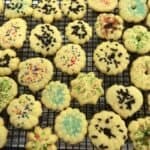 The highlight was making spritz butter cookies. Sometimes the green vegetable is not the star of the meal. Like on Thanksgiving it’s all about the turkey, the stuffing and the other carbs. And on Hanukah it’s all about the potato latkes and applesauce. Yet I still want to serve a green vegetable to round out the dinner. 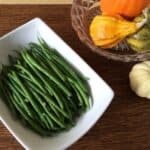 In such cases, this green bean dish is my “go-to” recipe. While I’m busy making all the other dishes, I want the vegetable to be quick and easy to prepare.